As my mother would confirm I am a complete clothes hoarder, I need another wardrobe...in fact we have had to turn the loft into another wardrobe, so we can switch between seasons? Sounds ridiculous doesn't it, with there being rails and rails of clothes complemented with flurries of anti-moth distillers - Bit of a de-tour if you need something right? Well, I just can't throw away clothes because I know that one day I will wear them! Whether I lose weight (slash I will never be a size 4 again), put on weight (too likely for my liking) or I mean what happens if that trend comes back in fashion (I know it will)? Sometimes, I get attached to particular items of clothing which in due course are taken from me - it's an ongoing joke with my dad and my step-mum seeing as they are the ones that usually force me to ditch them! In relation to my clothes hoarding...There was this American Apparel, white, crop shirt. Dad...remember this one? 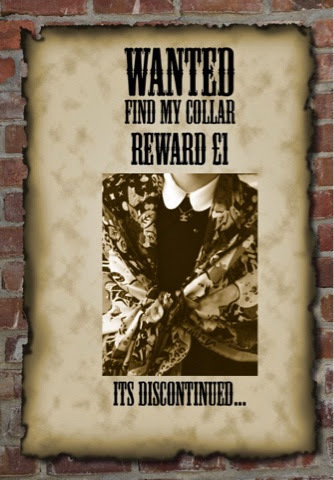 We still laugh about it today... (even though I am suspicious of its whereabouts) I loved how light-weight it was; I only used it for it's collar which I wore under dresses and jumpers galore. It got to the point where I had quite literally worn it to death and well...it had ripped. I resorted to ripping off the collar and doing a bit of DIY fashion and...Voila! I had a detachable collar. Where has it gone? I DO NOT KNOW! After rummaging around for this minuscule bit of fabric here and there for weeks. It has gone. RIP.